Top » Catalog » Game Specific Products » Star Trek: The Next Generation » RA-820-5061 Bookmark Us! 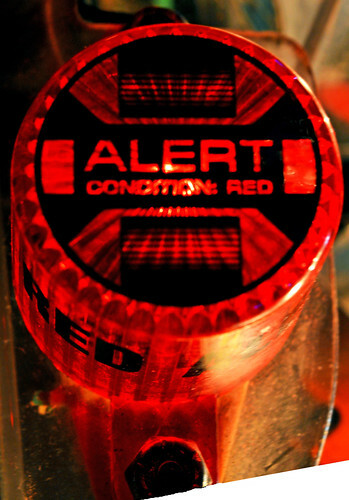 This set of self-adhesive Decals upgrades the top portion of your flasher domes with a Star Trek Red Alert symbol. Originally designed for the Data East Star Trek pinball machine; these decals are perfectly sized to fit easily to the top of the flasher domes and adds some zing to a normally boring flasher dome. We liked this idea so much we've created a set for Star Trek: The Next Generation pinball and Stern's Star Trek pinball machines. The STNG Star Trek kits comes with one "Red Alert" decal to go on top of the red flasher above the Beta Quadrant ramp. Finally, the Stern Star Trek kit comes with one "Red Alert" decal for the warp ramp return red flasher and one "Yellow Alert" decal for the yellow flasher dome to the left of the Beta Quadrant ramp. Free shipping (via USPS first class mail) if not bundled with additional items. Free shipping is only available in the Domestic USA. Notify me when "Alert Flasher Decals" is re-stocked.